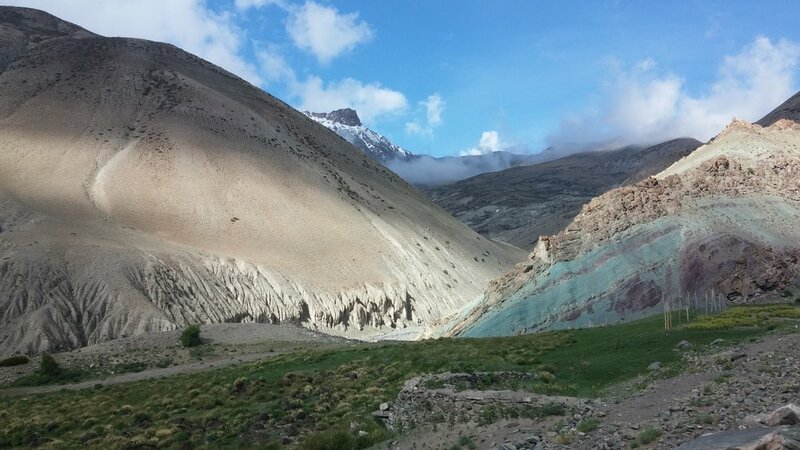 The Sham Valley Trek is the perfect introduction to trekking in Ladakh, as it is one of the easiest and most beautiful. Located north-west of Leh, the trek begins in Likir and ends at Tingmosgang, crossing three passes along the way – the Charatse La at 3,650m, the Sarmanchen La at 3,870m, and finally the Lago La at 3,750m. * Price based on twin-share accommodation. From cinematic moon-scapes to lush green oases to towering snow-capped peaks, the Sham Valley Trek showcases the range of incredible scenery that Ladakh has to offer. At a medium difficulty level, and often called the “Baby Trek” in Ladakh for it’s length, there’s no wonder that so many people choose this as their introduction to trekking in the region. Climb up toward the colourful prayer flags that mark the top of each pass, and descend toward the verdant pastures and mud-brick homes of the next village. Along the way see crumbling ancient fortresses still clinging to the cliffs, and the breathtaking Zanskar Range to the south. Leh to Likir to Yangthang: After breakfast in your hotel in Leh, drive to Likir, where the trek begins. As you enter the arid moonscape of giant boulders, it’s easy to feel miles away from the modern world. The green oasis of Sumdo village makes a stark contrast to the dry valley surrounds, after which you begin the ascent up the barren valley to the top of the Charatse La at 3,650m. From the top of the pass, descend into the beautifully situated village of Yangthang, where you’ll spend the night. Yangthang to Rizong Gonpa & Return: Today, head out for a side trip. The trail leads down from Yangthang through a narrow river valley surrounded by towering mountains on either side of you. This path brings you to a nunnery and then the remote monastery of Rizong, perched high on the mountainside with breath-taking views over the Zanskar Range. Return the same way, finishing in Yangthang again for another night. Yangthang to Hemis Shukpachan: Today you’ll tackle the highest point of the trek – the Sarmanchen Pass (3,870m). The trail zig-zags up the mountainside, with great views of the arid lunar landscape around you, to the top of the pass crowned in prayer flags. You’ll descend about the same distance again to reach Hemis Shukpachan, where there’s a small monastery and an oasis of green pastures. Hemis Shukpachan to Temisgang: Start the day by crossing another pass, the Lago La (3,750m) with magnificent views over the south side of the Indus Valley. Then descend to the village of Ang, and see the villages gradually become more prosperous and fertile as you carry on west. Your end point today is Temisgang, a once dominant village that controlled a large part of Ladakh. Camp amongst orchards and fertile fields, under the gaze of a ruined castle above you. Temisgang to Leh: After breakfast in camp, pack up and drive back to Leh. You can visit the famous temple complex at Alchi along the way, to arrive back in Leh by late afternoon.